As you read this paragraph, electricity jumps along your nerves to shock the muscles attached to your eyes into movement. These same physical forces, driving electric current through the dead inorganic circuits of your computer, bring these words to your screen. Though grade school textbooks list electricity as a physics concept, research on the role of bioelectricity traces back to the advent of modern biology. Luigi Galvani, an Italian anatomist, first used experimental science to connect electricity with twitching frog legs in the late 1700s. In an example of Enlightenment-era thinking, Galvani’s scholarship transformed anatomy by pulling in new concepts from physics. Galvani entered the University of Bologna in 1755 with aspirations of studying medicine and surgery. He became a permanent fixture at Bologna as a professor of anatomy by 1762, diligently studying anatomy for three decades before publishing the revolutionary work on bioelectricity and muscle movement for which he is most remembered. At Bologna, Galvani learned physiological theories of animal motion that prevailed across Europe at the time. Albrecht von Haller, a Swiss-born anatomist who did most of his work in Germany, popularised a doctrine that divided animals’ bodies into irritable parts (muscles) and sensible parts (nerves). The distinction between the two came as a result of some fairly gruesome experiments. Natural philosophers would vivisect animals (typically live frogs), douse the animals in acid, and poke their tissues with scalpels. If a tissue contracted on its own without a pained reaction from the animal, it fell into Haller’s irritable category — parts which contained some vital nature which gave them the ability to contract. If the stimulus produced a pained response in the animal, the offended tissue was designated sensible, meaning that it could convey sensory information to the rest of the body. When animals moved, Haller surmised, their sensible parts perceived some stimulus in the world and excited the irritable muscles into action. Haller and others collected experimental evidence to support irritability and sensibility. However, performing and reproducing Haller’s experiments was notoriously difficult for even experienced hands. And what was it that made a nerve sensible and a muscle irritable? Haller’s doctrine stopped short of probing the underlying causes, instead attributing vague fundamental properties to tissues and fluids. Galvani embraced the concept of rational medicine, which asked physiologists to look for those underlying causes using the scientific method. A new wave of researchers at Bologna and all over the world wanted to gain a fundamental understanding of how bodies worked to develop better medical treatments. Whether he knew it or not, dreaming up bioelectrical apparatus in a secluded laboratory, Galvani was part of that Enlightenment revolution. Popular legend suggests that Galvani discovered electricity could excite dead animal tissue to move by accident. The details vary with the telling. As Galvani bent over a frog, meticulously exposing certain muscles and nerves, either his wife Lucia or a laboratory assistant entered the room. A static spark from Galvani himself, one of his tools, or the frog jumped to the animal’s exposed nerve and jerked its legs into motion. Aha! A connection between animal motion and electricity! But in a research paper in 2003, Marco Piccolino, former professor of physiology at the University of Ferrara, argues that the serendipitous discovery narrative undermines Galvani’s rigorous scientific character. 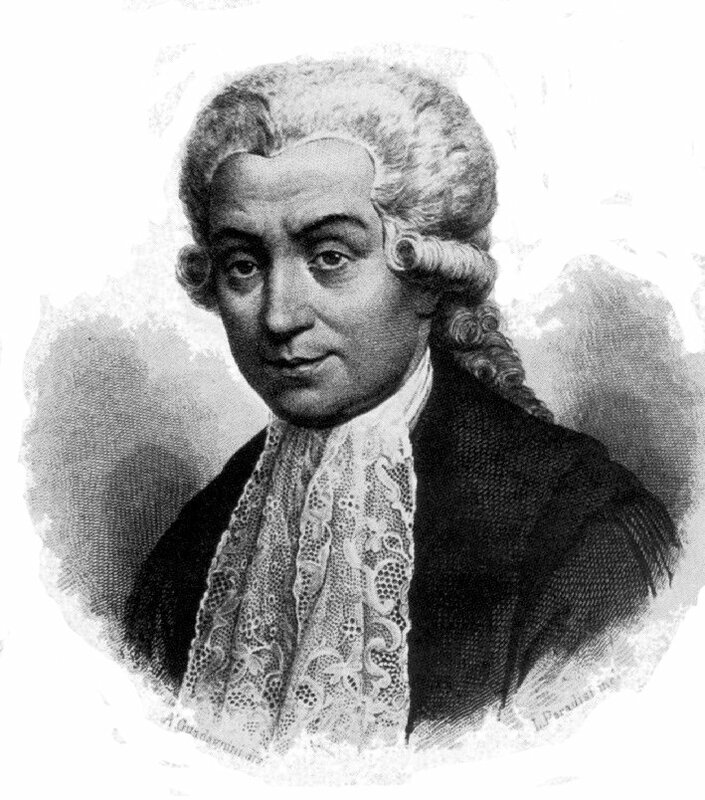 It took Galvani almost 10 years of detailed experiments to obtain enough data to be satisfied in his defence of his hypotheses. At the same time that Galvani and others turned a rational eye to medicine, experimentalists like Benjamin Franklin were revealing more about the mysteries of electricity. While serendipity — as it often does in physical science — played a role in Galvani’s experiments, Galvani innovated by drawing from cutting-edge research in both medicine and physics to put together a hypothesis on bioelectricity. As Galvani grew up in Bologna, inventors in Europe experimented with new devices that could perform useful electrical trick. 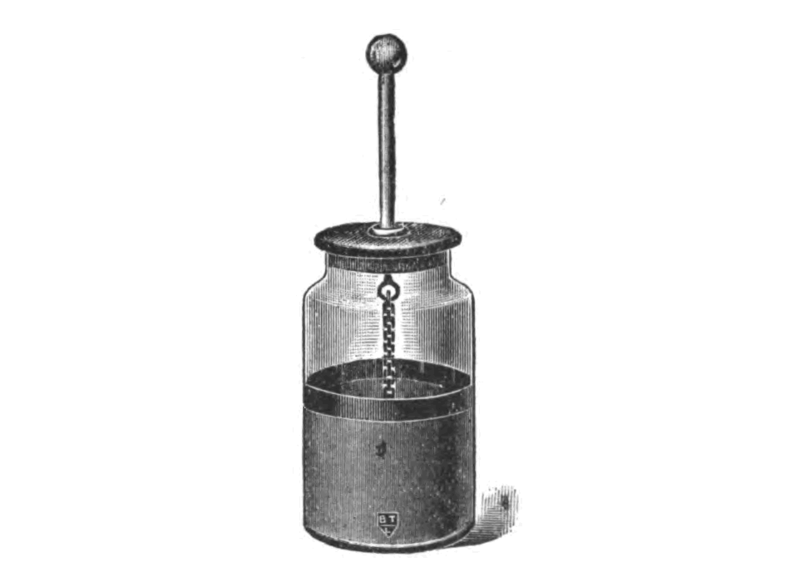 One of the most critical was the Leiden jar, named for the German town of Leiden. In the mid-1740s, Ewald von Kleist and Pieter van Musschenbroek independently built contraptions out of small glass jars coated inside and out with layers of metal foil. They found out — often painfully — that static electricity could be captured inside a Leiden jar, stored for days, and discharged at will with a violent electrical spark; modern recreations of the Leiden jar have clocked in from 9,000 to upwards of 20,000 volts. Critical to the Leiden jar’s ability to store electricity is that the inner and outer foils were not in contact with one another. A rod pierced the lid of the jar, and a metal chain hung from the rod to make contact with the inner foil. With the rod and the outer foil disconnected, no charge could flow between them; researchers could release the stored energy by touching both the rod and outer foil with their bodies or with a curved metal rod. By the time Galvani began his research into electricity, Leiden jars were well-known and available to experimenters. The on-demand electricity made Galvani’s experiments possible. Galvani’s experiments were necessarily qualitative. He asked, “Will the frog legs twitch this time?” He prepared the experiment, checked the conditions, documented everything, and produced a spark from his Leiden jars. Sometimes yes, sometimes no. Repeat. For a decade. The frog legs twitched when even a weak charge from a Leiden jar hit a nerve fibre. They did not twitch as readily when the jar shocked the muscles instead. Crucially, the force with which the frog’s legs jerked did not increase with the strength of the shock. The external electricity appeared only to signal some built-up force within the frog to release. Still, Galvani needed to be sure that the frog contractions produced by external electricity were connected to the frog’s natural movement. In one experiment, he set two frogs side by side. From one frog, he drew out a long nerve fibre and strung it across to the other frog. By touching the second frog’s nerves with the nerves of the first, he produced a contraction! Galvani was convinced of the relationship between electricity and animal motion. 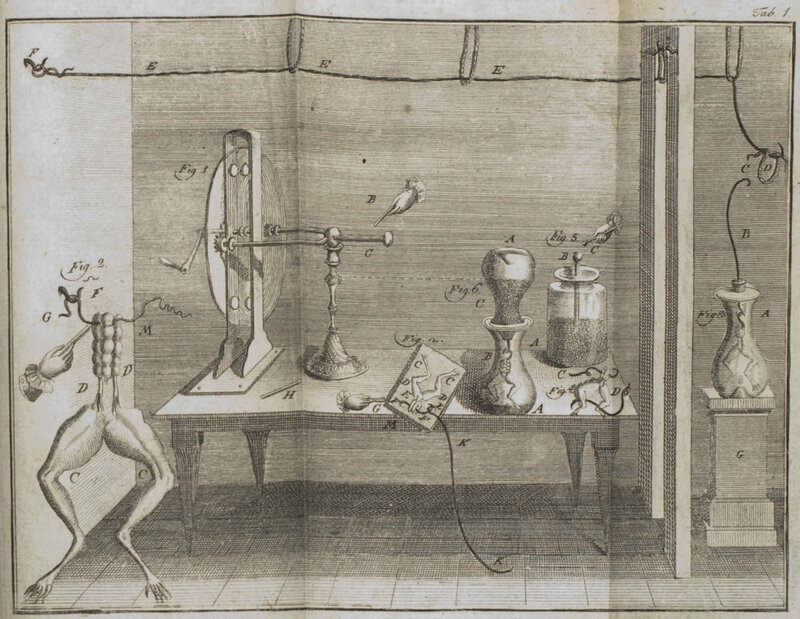 By assembling a library of conditions under which the frog legs twitched, Galvani began to persuade others of the connection between muscle contractions and the inorganic electricity observed by experimenters like Franklin and Alessandro Volta. A conclusion emerged: The frog contained some built-up electricity. This flew in the face of Haller and his ideas about 'irritable' and 'sensible' tissues. Everyone thought that animals were full of electrically conductive juices. How could electricity build up in a conductive medium? But in Galvani’s rigorous experiments, the data told a convincing story. Galvani used his data to paint a picture of the muscle-nerve interaction as a 'minute animal' Leiden jar in his magnum opus, De viribus electricitatis in motu musculari. According to Galvani, conductive nerve fibres were like the Leiden jar’s chain, penetrating the insulating sheath of the muscle fibre. Electricity built up on either wall of the muscle fibre. When the muscle and nerve were shorted, electricity flowed and excited the muscle to contract. How exactly electricity cause a muscular contraction, Galvani left for future researchers. His experiments did not — perhaps could not — lead him to any conclusions. He published only what he could defend with data. Galvani pursued an idea deemed impossible by many of his peers. He argued using experiments and data rather than the grand essentialism of medieval scholars. New tools such as the Leiden jar allowed him to take the fullest advantage of a diligent and meticulous character. By arguing from what could be observed and reproduced, and by bridging apparently isolated disciplines, Galvani showed scholarship that would become characteristic of the Enlightenment era. Edited by Diana Crow and Nathan Mifsud.